Director – Phil Weinstein, Supervising Director/Producer – Tad Stones, Screenplay – Tad Stones & Matt Wayne, Story – Mike Mignola & Tad Stones, Based on the Comic Book Created by Mike Mignola, Producers – Sidney Clifton, Scott Greenberg & Scott Hemming, Music – Christopher Drake. Production Company – Starz Media/Revolution Studios. Hellboy, Liz, Abe Sapien and mythology expert Professor Kate Corrigan travel to Japan to investigate the case of mythology professor Mitsuyasu Sakai who has become possessed after breaking into a colleague’s house. When Hellboy picks up a sword that has been dropped during the incident, he is transported into a strange realm. Guided by a fox spirit, he must traverse an unusual land inhabited by ghosts and monsters. He is told to hold onto the sword, while other spirit forces invoke him to break it so that he can return to the corporeal world. Hellboy realises that breaking the sword will unleash the demons Thunder and Lightning. Meanwhile, with their plane made to crash at sea by huge storm clouds gathering over Japan, Liz and Abe have to deal with a monster risen from the ocean floor. Hellboy Animated: Sword of Storms was the first of two animated films spun off from the live-action cinematic hit of Hellboy (2004). 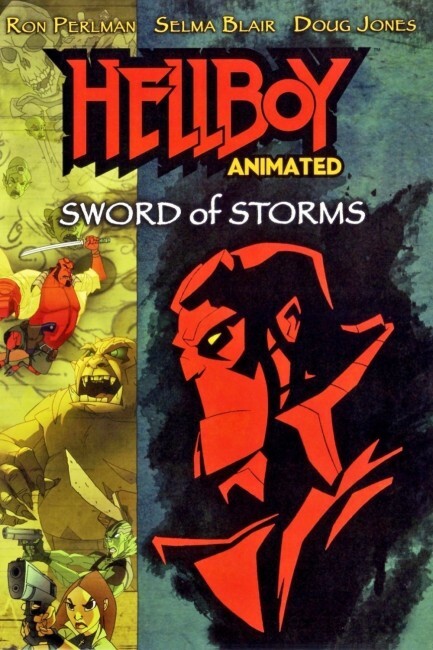 Sword of Storms was followed one year later by Hellboy Animated: Blood and Iron (2007), both being released in between Hellboy and its live-action sequel Hellboy II: The Golden Army (2008). Both of the Hellboy Animated films were executive producer by Hellboy film director Guillermo Del Toro and Mike Mignola, creator of the original comic-book. The animated films brought back actors Ron Perlman, Selma Blair, Doug Jones and, in the second film only, John Hurt to voice the characters they had played in the live-action films. The principal creative force behind these Hellboy Animated films was producer Tad Stones who receives the on-screen credit of Supervising Director. Tad Stones had risen up through the Disney ranks in the 1990s, producing animated tv series such as Chip ‘n Dale Rescue Rangers (1989-92), Darkwing Duck (1991-5), Aladdin (1994-5), Hercules (1998-9) and Buzz Lightyear of Star Command (2000-1), as well as directing Disney sequel fodder like The Return of Jafar (1994), which started off the unwelcome Disney video/dvd sequels fad, and subsequent entries such as Aladdin and the King of Thieves (1996), Buzz Lightyear of Star Command: The Adventure Begins (2000) and Atlantis: Milo’s Return (2003). In both of these Hellboy Animated films, Tad Stones recruits directors he had worked with on various other Disney shows. In this case, he has brought on board Phil Weinstein who had worked as an artist on various Disney shows before becoming a director with the video-released Balto: Wolf Quest (2002) and Balto III: Wings of Change (2004) for DreamWorks. I had seen Hellboy Animated: Blood and Iron earlier, even though it was released after Sword of Storms. Blood and Iron was a disappointment, lacking in the wild imagination of the Hellboy films and seemed churned out only at a level of routine tv animation. 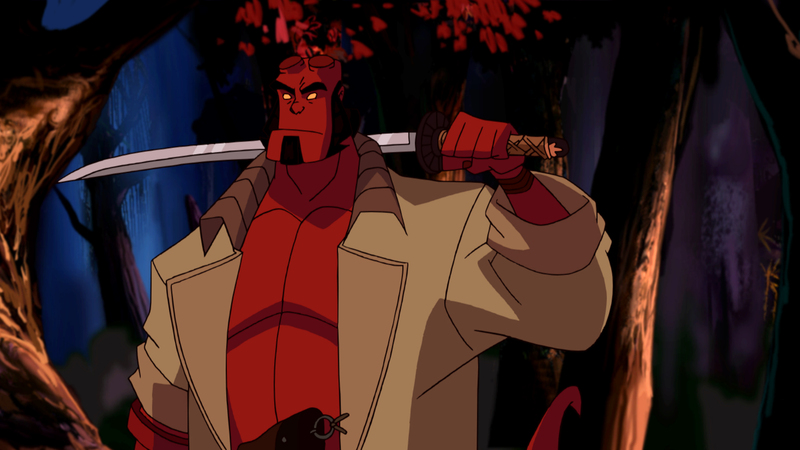 The good news is that Hellboy Animated: Sword of Storms is a much better film. This is immediately evidently from the vigorously staged opening scenes with Hellboy and Liz fighting bat creatures and revived mummies, which Liz deals with by incinerating them. Clearly, Phil Weinstein has a much better eye for staging action than Victor Cook did in Blood and Iron. That said, the animation still comes at the same cheaply produced level as Blood and Iron. There is not a great deal of plot to Sword of Storms. The B-plot about Liz and Abe having to deal with a sea creature risen off the coast of Japan seems perfunctory and not well integrated into the main story – these scenes seem inserted more to pad the film’s running time out than anything else. However, Sword of Storms‘ plus point proves to be a decided weirdness once the story gets Hellboy into the spirit realm. Often this seems like a series of sequential scenes with Hellboy encountering various apparitions:- being guided by a mysterious talking fox; coming to an inn where he is invited to join a group of other guests, before finding them all to be beheaded and then being pursued through the woods by their flying heads where their eyes have become searchlights; coming across a woman playing a koto who abruptly turns into a spider creature like something out of Wicked City (1991); an attack by animate musical instruments, sandals, teapots and a hopping umbrella. It is almost as though Phil Weinstein has set out to create the equivalent of wackily outré Japanese fantasies like Shinya Tsukamoto’s Hiruko the Goblin (1990) or Takashi Miike’s The Great Yokai War (2005). In fact, some of the images like Hellboy being pursued by women with snake-like necks, or the hopping umbrella and animate strip of scarf look as though they have been directly taken from the menagerie of bizarre creatures that populated The Great Yokai War.